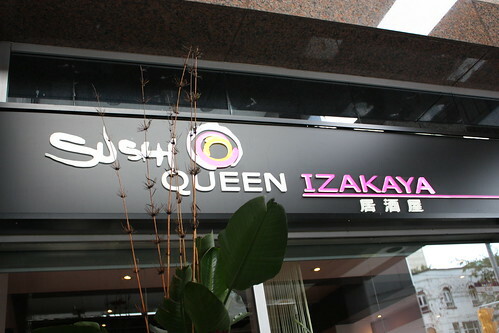 Sushi Queen Izakaya is located on Bay Street, two streets north of Dundas. It sits on the main floor of an office building at the corner of Bay and Elm Streets – with a decent sized patio facing Bay Street. 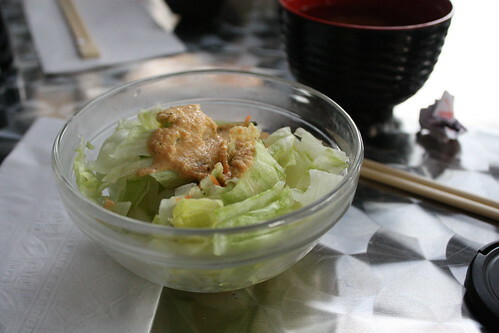 At the time of this review, Sushi Queen Izakaya had only been open a couple of months, at best. Please read our conversational review, below. 7.0 / 10Decent sushi at a decent price. 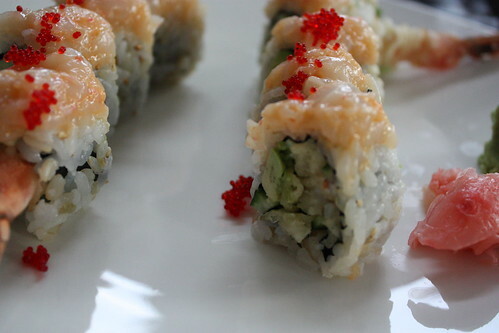 A huge variety of special rolls will be appealing for most Toronto sushi eaters. It’s a risk for them to open a sushi restaurant where another has failed however it looks like this place has a chance. 8.0 / 10Great service and a nice selection of rolls, although the rolls do fall apart easily. Decent nigiri. Enjoy the patio! I’ve become addicted to the ‘group buying’ services online that email you every day with a new deal you can purchase (if enough people purchase the deal, it’s a ‘go’ – if not, your money is refunded). 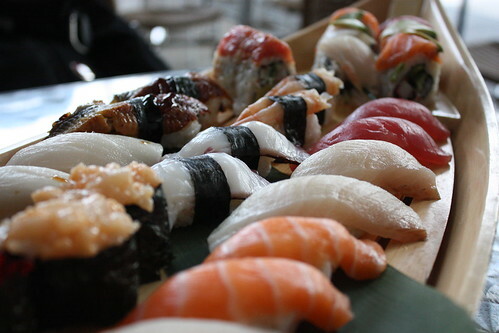 TeamBuy.ca had $60 worth of sushi at Sushi Queen Izakaya for only $28, which I thought was a pretty good deal. Also, I wanted to check out this newly opened sushi place as it is located in one of my former ‘hoods – namely the Bay & Dundas area. I arrived at 6:30pm and opted for the patio out front. I have actually been to this place for lunch a while back when it was called “Mochizuki”. It was kind of known for the rotating sushi bar but I always ordered off the menu. It was pretty good from what I remember as the sushi was quite fresh. When it closed down, I wondered what would be next and never imagined it would be another sushi restaurant! True. 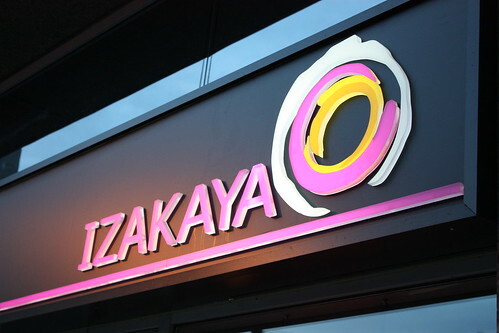 Replacing a failed sushi place with another doesn’t seem like the best idea, but I guess they feel Sushi Queen Izakaya offers something Mochizuki did not. Right away the service was prompt… I believe I had 2 (maybe 3) staff ask me about a drink order. I’d rather have that, though, than the opposite. I also showed my TeamBuy ‘coupon’ which was received well (sometimes you never know how they’ll react to the ‘coupon’ customers). When the staff member saw the dollar amount of the coupon she indicated we needed another table. She pulled another table along side to give us more room for our upcoming sushi feast. I appreciated that heads up service — rather that then have people scramble once the dishes come out. So far so good. Yeah the TeamBuy coupon was pretty sweet. Looks like we’ll be pushing our appetites this time around. The menu is quite extensive with lots of pictures. I also noticed that this place has all kinds of different types of different rolls. Obviously unique to Toronto since many are named after streets such as King St Roll or Yonge St Roll and of course the sushi pizza. We ordered the Pink Dragon Roll, salmon sushi pizza, and a large sushi boat consisting of a mix of nigiri and rolls (including one or two of their specialty rolls). The sushi boat chosen was the Sushi Yonge Street, which runs $40. Looks like we have pretty much maxed out the coupon! I took a quick tour of the inside of the restaurant when I went to go wash my hands in their washroom. They’ve changed some things around and made it more of an open concept. 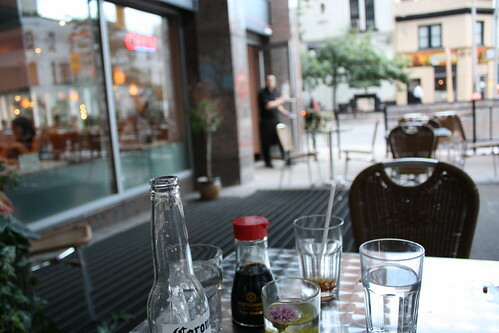 I remember when it was the old restaurant, there was a lot of barriers/walls so it felt a lot tighter to move around. Tonight, the room was about half full of customers. 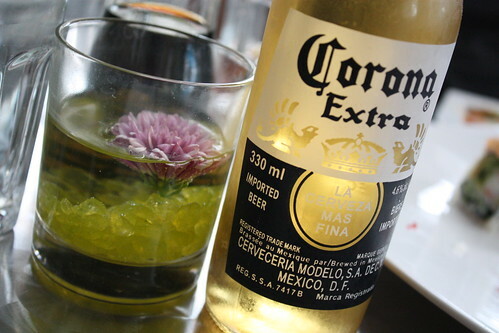 Oh, I ordered up a Corona and it came with a lime (!). Why that’s a big deal is almost 99% of sushi places we’ve been to it comes with a lemon — and I’m not a fan of that. OK, onto the food. Soup and salad arrived first. The salad was good. I never partake in the soup, so I’ll leave that to my review partner. After that the sushi pizza arrived. It was quite good – no complaints here. The miso soup was decent but it tasted pretty much like everyone else’s. It must be a standard recipe so it seems to taste more or less the same everyone. I would be curious to find a place that has “the greatest miso soup” and see what that supposed to taste like. As long as there’s tofu, and it’s hot – it’s probably fine by me. 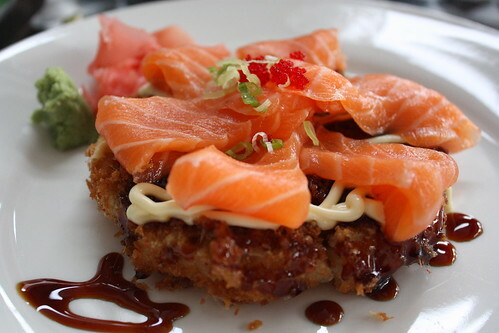 Oh yeah and the sushi pizza tasted pretty good too. Next up was the Pink Dragon roll. It tasted half decent, but seemed really soft and ‘fragile’ for lack of a better word. It seemed to come apart quite easily. Yeah the rolls did break up pretty easily. I guess that’s a bit of a common theme among the rolls. They were all pretty decent tasting though. The sushi was good too, and they were pretty liberal with the portions. I also noticed that it’s looking more and more like we won’t be able to finish it all! The spicy salmon rolls (too bad there were only two pieces though) were fantastic. Even the standard Rainbow, which usually are ‘meh’ was quite good. The Spicy Tuna Dragon didn’t it do if for me, however. The nigiri I had no complaints with. 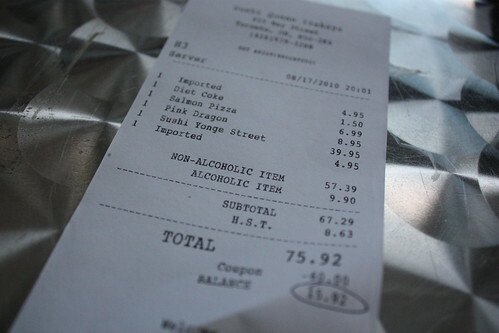 But, yes, to your comment, the $60 worth of sushi we ordered was too much for two people. We maybe should have brought in a third on this review. The service hadn’t dropped off a bit – they were around throughout the meal to check in on things. Think the exact opposite of what Hiro Sushi deems as ‘service’. Ha I know you still feel the sting of Hiro Sushi! Being out on the patio, sometimes service tends to suffer a bit but not here. They were more than attentive and that is a welcome change. The place started to get more busy as well, both in the patio and the inside dining area. The wide variety of rolls looks to be a crowd favourite. True, I hope this place makes it. 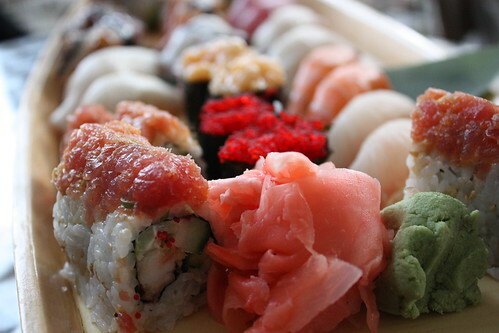 Good service and good sushi should be rewarded. Hopefully they don’t face the same fate as Mochizuki did here at Bay and Elm. We got the remaining bits of sushi packed up ‘to go’ and then asked Frank (one of the many servers) how business was doing. Frank (pictured above – sort of!) said things were a bit slow and they needed to do more advertising to get people in the door. There are many large condo buildings nearby (the ‘Bay Street condo corridor) so I’d suggest a simple flyer or menu mail out to at least a few of those buildings. Ditto for some of the office towers nearby. Leveraging TeamBuy was a good move, though. Well done. Anyway, I hope they stick around. I’d come back without a coupon for sure: 8/10. It’ll be interesting to see what happens. It’s in a great spot and I can imagine it pretty busy for work/lunch time during the weekdays. I remember Mochizuki being pretty busy during lunch as well so I guess the key to success will be evenings and weekends. Good luck to them! Decent sushi with great service. 7 / 10. Amazing Service, Amzing Food, Quanity vs Dollar is Amazing. Highly recommened. i just went there today. the fish is fresh but i am disappointed with the rice. it was not well cooked and a little bit hard. i think I will not go back again. sori sori sori sori….